GJ Plastics Ltd is a Northwest based company with over 30 years experience, producing a large range of Acrylic Display Products, Signage and Promotional displays and Correx Printing. We specialize in producing exceptional products that exceed expectations; because we produce all our products in house, from initial concept to manufacture in our state of the art manufacturing facility, we are able to produce high quality products with rapid response to demand and those little alterations that make our products unique to you, while helping you do more with less by keeping prices low. Solid Works 3D Cad software. Roll and Flatbed Large Format Printers. 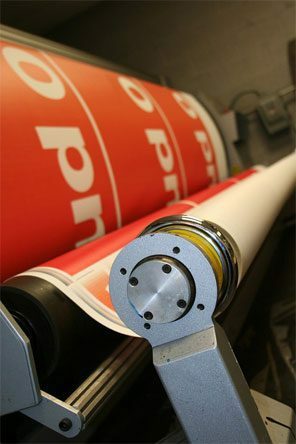 Our Large Format Printing Department allows us to not only produce in house our own roller banners, Correx Printing, outdoor promotional banners and vinyl stickers we can also direct print to acrylic, correx fluted polypropylene, aluminium composite board and foam PVC. This allows us to produce branded display products such as magazine dump bins, wall art or print onto our designer acrylic photo frames range. Many different materials are used in the manufacture of our product range, including, Acrylic, Foamex, Polypropylene, Styrene, Metal and Wood. Whatever the material, it will be in safe hands our design, production and technical team are highly qualified and experienced in product design and manufacture. Many of our Point of Sale and display products are held in stock for immediate despatch. However, if manufacturing is required most of our products can be manufactured in 1-2 weeks. It’s always worth asking if you need something urgently, we welcome a challenge! Whether you require one of our standard stylish quality displays. Or you wish us to produce a bespoke display product, combining your concept with our flair for creative, visual and stylish display solutions to maximise impact, we look forward to demonstrating to you our strength in design, manufacture and supply and bring you innovative concepts at competitive prices. We design and manufacture both exterior and internal signs and have recently produced all the interior and exterior signs for the new Bury Hospice. We redesigned all the signage for the five hospice shops around the six towns of Bury. Our team designed and produced new signage for Middlesbrough Football club training ground. We also produced Bury Football Club signage to the interior and the Correx Printing boards around pitch. GJ Plastics are proud to say we have also provided display solutions for a Formula 1 Racing Team and Wimbledon. G.J. Plastics Ltd have delivered bespoke solutions to in-store marketing requirements for companies which include B&Q, Jewson, Asda stores, BNFL, Bank of England, Halifax Bank, Barclays, Selfridges, Government departments, Museums, Art, galleries, Travel & Leisure industry, JC Decaux, Pets at Home, etc. We service the UK and Eire, however, we have supplied product to clients in practically every country in the world. These include Australia, Spain, Greece, Malta, France, Dubai, USA, China, India, Malaysia, Germany and Portugal and even Cape Verde. The company have an enviable reputation for designing and manufacture. Quality point of sale display stands, for the magazine, newspapers retail and exhibition sectors and high quality Correx Printing. The company is continually growing and searching for better ways to provide quality of products and services in an efficient cost effective way. GJ Plastics Ltd have over 30 years’ experience in the point of sale industry. Delivering bespoke and off the shelf solutions to in-store marketing requirements. As you will see on the site we have an extensive product portfolio. A wide range of cable displays, poster holders, poster stands, Correx Printing, display showcases, and display stands. Also produce magazine newspaper dump bins, counter dispensers, leaflet-holders, plinth bins, newspaper stands, magazine stands, pod stands to hold newspapers and magazines. We manufacture brochure and leaflet holders. We also have solutions for leaflets, brochures, promotions and retail and exhibition sectors. Our Cut Plastic Sheet department has been created to meet the growing market demand for bespoke cut to size panels. GJ Plastics Ltd are also one of the leading suppliers of cut to size plastics. Offering a comprehensive range of materials, we provide you with outstanding customer service, impressive lead times and quality manufacturing. Using our state of the art equipment.Use our online price calculator to cost your cut plastic sheet then buy online. The Skills Pledge is a voluntary public commitment from employers. The aim is to encourage and also support employees to improve their skills and gain qualifications. The Skills Pledge help those employees who need to gain skills to at least a level 2.